Robotron 2084 is unlike any other video game around. 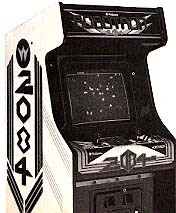 Designed and programmed by Eugene Jarvis, the creator of both Defender and Stargate (all manufactured by Williams Electronics), Robotron is one of the most dazzling arcade games released in 1982. Eugene's games are unique; they have attracted a following of players who like a special amount of freedom in their games. People who play Jarvis games become devoted to them. Eugene likes to reward players who do well, therefore all of his machines award bonus men at specified point multiples, and they keep on giving away extra men as long as the player can reach the next multiple. Along with freedom of movement, and unlimited bonus men, Robotron boasts stunning graphics and an exhilarating pace. As in almost all video games, the object of Robotron is to earn points. Points are awarded for destroying robots and saving humans. Most machines are set to start off a game with three "lives." When all of the player's men are gone, the game is over. The controls on Robotron consist of two eight-directional joysticks. The left stick controls the movement of the player on the screen; the right one fires the anti-robot machine gun. 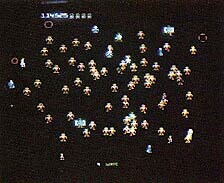 In Robotron, unlike Berzerk, you can move in one direction and shoot in another. The scenario for Robotron is as follows: In the year 2084, technology has become so advanced that our own creations, the robots, decide that the human race is expendable. They determine to reprogram or destroy every remaining human on the planet. It is up to you to stop them. You must save as many humans as possible, by simply running your man over them. All robots, with the exception of the Hulks, can be destroyed with a single shot from your gun. Running into anything other than the walls or humans results in your instantaneous death. 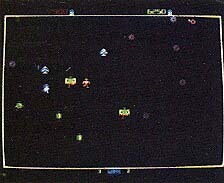 As the game begins, the robots materialize on the screen before you. Use this time to pick a target area to attack. It is best to blast your way to the edge of the screen; with one of your sides protected by the wall, only three sides are vulnerable to attack. Once you appear, start wasting the robots with your laser gun. Even if there is a clear path to the edge, continue to fire at the robots as you move. 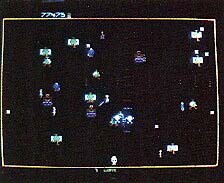 The most important thing to remember about Robotron is that firing is independent of movement. This means that while running in one direction, you can shoot in another. Never stop firing unless you are about to clear a board, but want to save a human first. The only way to earn really big points is to save as many humans as possible. The first human you rescue is worth 1000 points; each one after that increases in value by 1000 points until they reach a maximum of 5000. Most machines are set to award a bonus man at every 25,000 points. Any machine that is not at this setting is not worth playing; refuse to deposit a single quarter in it. With a free man at every 25,000 points, you need save only seven humans to win an extra man. Thus, it is very important to save the humans. After you lose a man, or at the beginning of every new board, the value of the humans starts off again at 1000 points. Don't spend too much time in one place; keep moving. The best technique is to circle around the perimeter of the screen while constantly firing into the center at the robots. Just like a shark, if you stop moving, you are sure to die. 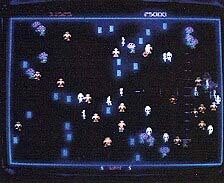 On every ninth screen you must battle an awesome number of Grunts--over a hundred robots on the screen at one time. This screen usually relieves most players of at least one man, although it need not. As the robots materialize, look for the area with the lowest concentration of them; this will be your path to the side of the screen. Point your man and aim your gun in that direction before you appear on the screen. Once you materialize, start firing and moving--without hesitation. If you successfully reach the edge, start your circular sweep of the screen; shooting the Spheroids as you do. Don't slide along the outside wall, but stay close to it at all times. You should complete this screen after about two passes around the playfield. When there are only a few robots remaining in an attack wave, and some humans are still wandering around, don't complete the wave by shooting the robots. First, rescue the humans. You may have to do some fancy footwork to avoid shooting the last remaining robot, but the points you gain by saving even one human are worth the effort. Remember, it is acceptable to place your man in jeopardy from time to time, because you can always win another. By following these tips and understanding your enemies' strengths and weaknesses, it is easy to rack up points in the hundreds of thousands. The following are profiles and hints on how to beat each of the robots you encounter while playing Robotron. These immobile obstacles are not robots, but are still deadly on contact--to both you and Grunts. In each new attack wave, the Electrodes change shape, but they remain lethal. Shoot any that are in your way. You don't get any points for this, but it is easier than maneuvering around them. These robots appear in overwhelming numbers. They are programmed to converge on your position and crush you. Rather than spending time picking off Grunts one by one, blast at them when they are in groups. Their movement is easy to predict, so lead Grunts into Electrodes, and watch them explode. The Hulk is the only species of robot that is truly indestructible. Hulks kill humans (and you) with a single touch. Your laser blasts can only slow down or divert a Hulk. If one is about to run into a human, shoot at the Hulk in an attempt to turn it from the human. Stay away from the walls when Hulks are nearby; they can easily turn and crush you as you try to sneak by them. Although they don't pose much of a threat themselves, Spheroids release deadly Enforcer Embryos. Hence, the red, pulsating Spheroids should be destroyed as quickly as possible. They should almost always be your primary targets. If you shoot a Spheroid, it disintegrates and can't release any Embryos. The thing to remember is that, due to a programming oversight, Spheroids tend to get stuck in the corners of the screen--this is highly beneficial to you. With precise aim, you can shoot at three corners from the same position and knock out most of the Spheroids. Embryos spawned by Spheroids grow into Enforcers. The main weapon of an Enforcer is its ability to launch Sparks at you. The weakness of the Enforcers lies in the fact that when you are close to them, the Sparks they emit travel slower. Sparks tend to slide along the walls, so stay away from the edges if Enforcers are firing at you. These guys are the most dangerous Robotron opponents you can face. Fortunately, they appear only every fifth wave. Brains should be your primary target whenever they appear. They are extremely deadly, because they fire Cruise Missiles that chase you around the screen. To destroy a Missile, run from it while simultaneously firing at it. Brains also possess the power to reprogram humans into kamikaze-like Progs. By Simply touching a human, a Brain can transform him into a deadly Prog, which runs around aimlessly like a chicken with its head cut off. These are your second most deadly opponents; they are surpassed only by the Brains. Tanks fire Shells, which rebound off the walls. On boards with Tanks, go to the edge of the screen, preferably near the middle. Shells can make some pretty unpredictable bounces, and if you are near a corner, you may get hit. Fire at every Tank within range while picking off the Shells as they approach you. The problem most people have is that they don't recognize each Shell as an individual opponent--it is, and should be treated as such.